February 2016 - Perry Hood Properties, Inc. Whether you’re a first time home buyer, or have been through the process before, there’s an art to house hunting. Some specific strategy and planning is needed in order to find the home you want, in your price range, and do it in an efficient amount of time. Included here are some unique tips for home buyers searching for their next home. These likely include ideas you wouldn’t think are important, but can save you time and help make your house hunting experience simpler and much less stressful. 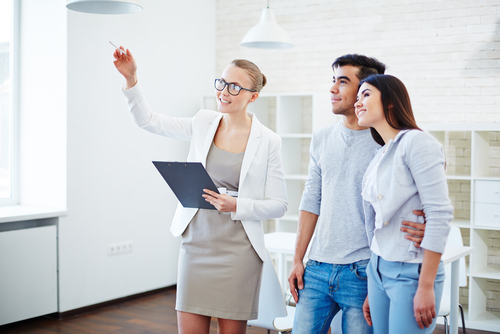 First and foremost, understand that looking at houses will always take longer than you expect. Don’t schedule time to go look at a few houses in the morning, and plan to meet friends for lunch. You may be finished by then, but to do so you may feel the need to rush through some houses and have to come back again later. Or, you may find a house you really like, spend most of your time there, and then want to make an offer. That could be a couple hours or more on that one house. So, block out an entire day and be ready for the process to take as long as you need it to. You may not consider your meal choices to have an impact on your home buying experience, but they absolutely could. You’ll probably want to eat before going to look at houses so you don’t have to cut your tour short because of hunger pangs. As far as drinks go, it’s probably best to avoid them for the most part. Many house hunters will take a drink with them as they walk through houses. That could become an issue if you suddenly need to use the facilities. Think about it. The houses you’re looking at are likely either still being lived in, or are empty and likely not stocked up on essentials. Either way, it’s not an ideal situation. If you need to, plan a quick pit stop in the middle of your tour, then resume hunting. This is another strange sounding tip, but it can make a big difference. Many of the homes you visit will have carpet, and some may specifically ask you to remove your shoes. If you visit more than one of these homes, you’ll be thankful you don’t have to tie and untie your shoes at each one. Some realtors provide the slip-on booties that go over your shoes, but those can be slippery. Your best option is to walk through in bare feet, or in your socks. You may think you’re being polite by not snooping through drawers, cabinets and closets when visiting a home that’s still being lived in, but you’re actually missing out on an opportunity. If you like the rest of the house, make sure you’ll also like the storage available. That means going into the garage, opening drawers and cabinets in the kitchen and bathrooms, and looking around in closets. You’d hate to put an offer on a home, then find out later that the closet space is lacking, or that drawers or cabinets are much more shallow than you thought. Finally, remember that you’ll need to negotiate with the owner of the house at some point if you plan to buy. Those negotiations become much more difficult if they hear you trashing their home, decor or other elements during your walkthrough. You never know when the owner of the home will be within earshot, so keep it clean while you’re in the home, then discuss with your spouse and realtor when you leave if there’s something you’d like to avoid in future houses. If you’re ready for a new home, start your search at Perry Hood Properties. We have an assortment of available, move-in ready homes in Tulsa, Bixby and Broken Arrow. Or, we can start construction on a new custom home just for you using our variety of floor plans. Contact us today by calling 918-250-2663. After you’ve lived in your home for awhile, there’s a need to update to bring decorating styles up to date, or just for a fresh look. That can be done by painting walls, adding furniture, or decorative pieces, or sometimes just by rearranging. But, if your budget doesn’t cover the cost to update your entire home, you’ll need to prioritize what comes first and find some cost-effective ways to refresh your home’s interior. Here are a few tips to help you do just that. For most of us, the living room gets a lot of traffic. It may be the most used room in the house, or just behind the kitchen. It’s also where guests will likely spend the majority of their time. So, investing in the design of your living room will be a worthwhile endeavor. This could mean a complete overhaul, or just adding and removing a couple key pieces. Your walls are always a good starting place. If it’s been more than three years since you’ve painted, changing the color or just repainting with a fresh coat of the same color is a good option. You’d be surprised how much different a room can look just by freshening up the paint so it looks its brightest again. Be careful about your choices, however. Wilder, or more personalized design choices will go out of style faster and often make your home more difficult to sell. The same idea goes for furniture, although obviously it’s not a concern when selling your home. Some styles are timeless, while others will quickly be out of style and require another update. 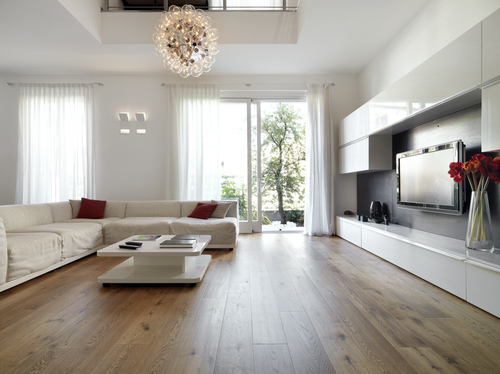 Your lowest cost option would be to simply remove some things from your living room to make it more open and less cluttered. If you have lots of pictures hung on walls, knick knacks or artifacts on shelves and too much furniture for the space, removing some of it could make a significant difference. As mentioned, your kitchen is another high traffic area. If you do a lot of cooking or baking, it’s also a room you’ll find yourself in quite a bit, which means it’s worth it to update it. If you don’t currently spend much time in the kitchen, creating a more modern look for it could make it more inviting for you. A new paint job is a good start in the kitchen too, but you’ll also want to assess the shape of your appliances. Replacing refrigerators, ovens, stoves and dishwashers can be a bit pricey up front, but with more efficient models available, you could actually pay significantly less each month in energy costs. Depending on the age and look of your appliances, replacing them could also immediately invigorate your kitchen’s look. Consider stainless steel appliances to give your kitchen the modern look. If you can, new counters or a new backsplash can also have a profound impact and make your home more attractive to potential buyers. Taking a critical eye to your bedroom can help you create a more relaxing, personal space for you to start and end your day. Unlike other areas of your home, your room gives you an opportunity to fully express your personal style with paint colors and wall hangings. You’ll still want to consider what decoration has the chance to last, and what will quickly be out of style. This is for the sake of your own budget so you aren’t wanting to refresh the look again in a matter of months. Thinking about how you use your bedroom typically will help inform your design decisions. If you only spend time in your room to sleep, you’ll want to be sure to create a tranquil, relaxing space. But, if you watch TV, exercise, read, or commit time to other hobbies, you’ll want to incorporate that into the design as well. And, if you have a master bathroom attached to your bedroom, consider creating a look that can be replicated and adapted for the bathroom too. If you decide that you’re ready for a new home to decorate, contact us at Perry Hood Properties. We have a variety of floor plans and availability in some of the most popular neighborhoods in Tulsa, Bixby and Broken Arrow to help you create your next home, or have available homes that are move-in ready. After a fairly mild winter in Oklahoma, spring is just around the corner. Before long, most of us will be shutting down our heating systems and starting our air conditioners. Since your AC unit likely hasn’t run since early last fall, it’s a good idea to perform some preparation and maintenance before you need it. Here are a few tasks to complete just before spring. Each time you change from using your heater to using your air conditioner, it’s also a good time to change your air filters. This is simply because it’s an easy way to remember to change them at least twice per year. Doing so will result in a noticeable difference in the quality of the air in your home. In many cases, especially if you have pets, it’s necessary to change your air filters more often. 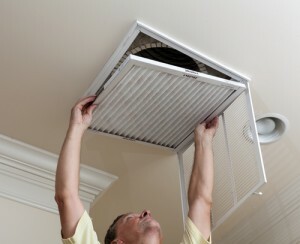 It’s recommended that you check your air filters every 30 days and replace them when they look dirty and clogged. The worst case scenario when the weather gets warm is that your air conditioner breaks down and requires costly repairs. Your AC unit will age over time and eventually wear out, but you can extend its lifespan by performing regular maintenance and inspections. Have a professional check out your air conditioner before starting it up this spring so they can tell you about parts that are worn or damaged and may eventually cause a complete failure. This maintenance along with some regular cleaning can keep your air conditioner running for many seasons to come. While you have an HVAC professional out to inspect your air conditioner, also ask them to inspect your ductwork. They’ll be looking for leaks in your ducts that make it more difficult to cool your home. This makes your home less comfortable, puts more strain on your AC, and costs you more in energy bills. It’s definitely worth it to have your ducts inspected once per year to make sure they’re as efficient as possible. This is an easy upgrade you can make yourself that can have a noticeable impact on your energy bills. A programmable thermostat will allow you to set the temperature in your home based on your schedule. So, when you leave for work, you can let your home get a little warmer, then start to cool it down before you get home. You can also start cooling it more when the sun goes down if you like it cold when you sleep. This will allow you to use less energy when you don’t need your air conditioner to run, and still keep your house comfortable. Before you need your air conditioner this year, make sure it’s up to the task to ensure it is efficient, and capable of cooling your home all summer. If you’re ready for a brand new home by the summer, contact us at Perry Hood Properties. Browse through our list of available floor plans to find one perfect for your new home, or find your next home in our selection of already constructed, move-in ready homes. The winter months can be hard on your roof, even in Oklahoma where the winters are more mild than some northern states. While we’ve enjoyed a temperate winter this year for the most part, there’s still a chance we see one or two more wintry storms before we get to spring. With that in mind, here are three issues to watch for that cause serious damage to your roof. This is a product of improper insulation and ventilation in your attic. Condensation forms when the warm air from your home comes in contact with the cold air from outside. This results in moisture building up and can cause mold and mildew to form. To combat this, it’s important that your roof and attic are both properly sealed and insulated to prevent cold air from getting in. Additionally, properly ventilating your attic will prevent condensation from settling if it does form. Instead, the ventilation will help condensation evaporate before mold and mildew is able to grow. In the fall, we all check our gutters for obstructions like leaves and dirt. Few of us think about obstructions occurring during the winter months, but snow and ice storms can result in ice dams. These often happen when water sits in your gutters and then freezes. The resulting ice then keeps melting snow and ice from the top of your roof from getting through. What you’re left with is lots of water with no where to go and, usually, it ends up seeping into cracks in your home’s exterior where it can again cause mold and mildew. Your first step to preventing ice dams from forming is ensuring your gutters are free of any foreign objects before the first snow storm. It might also be worth it to check your gutters after a freeze to clear out any lingering ice. Attic ventilation can be helpful here too. If any water should get in, the ventilation will help it evaporate. While many of us think icicles are a beautiful sign of winter, they’re also harmful both to your home and potentially to you and your family. 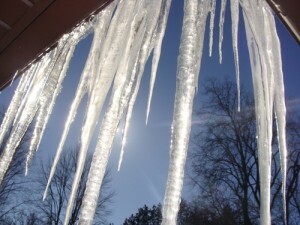 They form under similar conditions as ice dams when water from your roof is unable to flow freely through your gutters. In many cases, there’s no good way to completely prevent the formation of icicles, but keeping your gutters clear will certainly help. From there, it’s important to simply knock them down periodically. Allowing them to accumulate creates the possibility that one may fall on a person. And, during longer cold snaps, icicles can actually create enough wait to damage gutters and your roof. Whether or not we’re in store for another winter storm this season, these tips are helpful for keeping your home safe for winters to come. If you’re ready to have a new home to care for by next winter, contact us at Perry Hood Properties. We have a variety of move-in ready homes in Tulsa, Bixby and Broken Arrow, or can help you create your own home using our floor plans.